Read the books that inspired the How to Train Your Dragon films! This book will be a hit with children and adults alike. THE STORY BEGINS in the first volume of Hiccup's How to Train Your Dragon memoirs...Hiccup Horrendous Haddock III was an awesome sword-fighter, a dragon-whisperer and the greatest Viking Hero who ever lived. But it wasn't always like that. In fact, in the beginning, Hiccup Horrendous Haddock III was the most put upon Viking you'd ever seen. Not loud enough to make himself heard at dinner with his father, Stoick the Vast; not hard enough to beat his chief rival, Snotlout, at Bashyball, the number one school sport and CERTAINLY not stupid enough to go into a cave full of dragons to find a pet...It's time for Hiccup to learn how to be a Hero. How to Train Your Dragon is now a major DreamWorks franchise starring Gerard Butler, Cate Blanchett and Jonah Hill and the TV series, Riders of Berk, can be seen on CBeebies and Cartoon Network.Read all of Hiccup's exploits in the How to Train Your Dragon series: How to Train Your Dragon, How to Be a Pirate, How to Speak Dragonese, How to Cheat a Dragon's Curse, How to Twist a Dragon's Tale, A Hero's Guide to Deadly Dragons, How to Ride a Dragon's Storm, How to Break a Dragon's Heart, How to Steal a Dragon's Sword, How to Seize a Dragon's Jewel and How to Betray a Dragon's Hero. 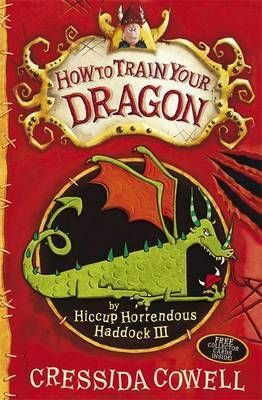 Check out the brilliant website at www.howtotrainyourdragonbooks.com It's the place to go for games, downloads, activities and sneak peeks!